I’m more of a muffin maker than a cookie monster but last week I mixed things up a little. Why? Because I’m a stickler for routine and doing things I’ve always done. So, when something goes well in the kitchen I tend to put the recipe on repeat. It’s a good thing for someone like me who loves familiarity over spontaneity. But change is good right? These cookies were born out of a quote I saw on change – it read something along the lines of “stepping outside your comfort zone is the best way to grow”. So true. This year I embarked on a year long break from a corporate career – to put myself outside my comfort zone. And, 6 months in I can honestly say (without sharing the detail here) that the change has brought me so much personal growth. If I can embrace such a huge life change surely switching out my weekly batch of muffins for cookies would be a breeze. It was – and here’s the result. 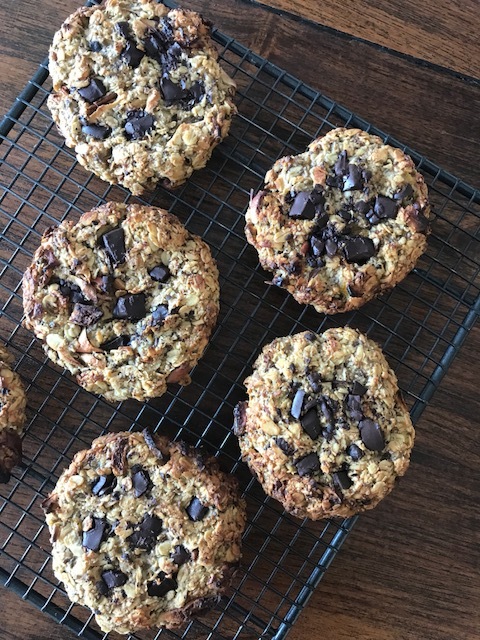 Chewy, vegan, refined sugar free and flour-less cookies. Mash the bananas – add to the oil. Add the oats, cinnamon, nutmeg, dried fruit and chia seeds – mix well. Make sure it binds together well. Shape into 6 large or 12 small ones. Place on a baking sheet/ tray. Add the chocolate – push a few bits into the top of each cookie. Cook in the oven at 180C for 20-25 mins (adjust based on cookie size). Cool then store for 3 days in an airtight container in the fridge or enjoy warm. And, before I go, I’d love to know – are you more of a muffin maker or a cookie monster!? 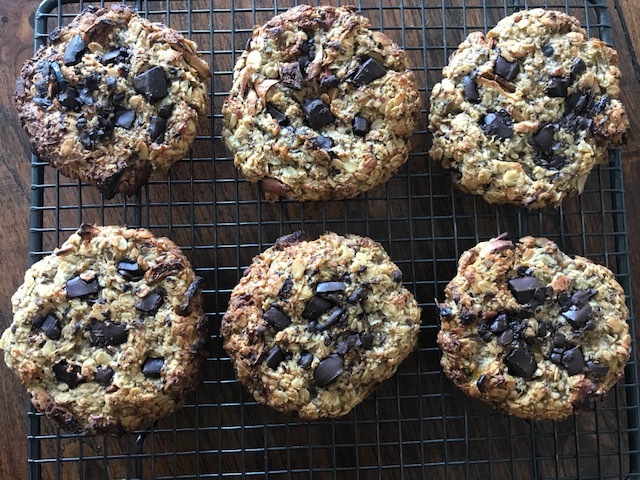 Tags: Cookies, easy, oat, recipe, vegan. Bookmark the permalink. These sound delicious. Love the addition of chopped dried fruits. Thanks Ronit – yes a great way to use some of the fruit I’ve been dehydrating! Change is always good, Laura! 💕 I am more muffin maker as everyone here prefers it. Chia seeds are so good when baking, right? I love its addition! Good to hear you’re in my muffin camp Vero and yes chia seeds are great in baking – and so good for us too! 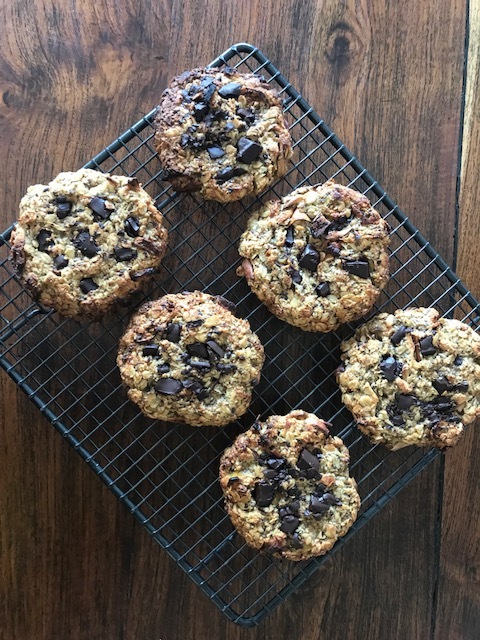 Wonderful vegan cookies recipe! I like the addition of oats in place of plain flour. Thank you for stopping by, I’ll have to check out your recipe too! 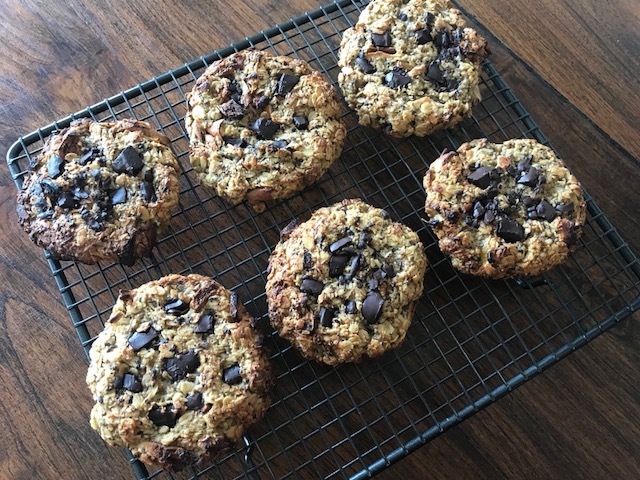 Love this recipe with banana, coconut oil and chia seeds, Laura! And I am mostly the muffin maker though I love to bake cookies as well. Thanks for your kind words and here’s to going beyond our muffin comfort zones! I hope you try these cookies…. Fabulously nutritious recipe for Christmas. Oh no trouble I’ll take that as a complement!